Pole barns from PJ Buildings are customized construction, allowing us to create pole barns with total flexibility and versatility. We create custom buildings tailored to your individual needs, budget and style. We use quality materials to build them OR we supply you with a complete diy kit including lean-tos or porches, roll up doors or sliders. 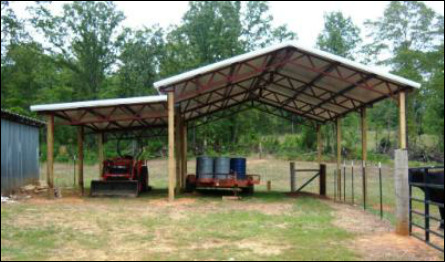 Affordable - custom built pole barns cost less than pre-fab prices. Our customers save! Multi-use facilities - versatile construction to satisfy individual uses and needs. Custom pole barns complement existing homes and surroundings. They can have any type of siding and roof layers so that they match existing buildings. Enclosed pole barns use post-frame building design to create economical buildings that are efficient and practical. They are not just “pole barns” or "pole buildings" anymore. 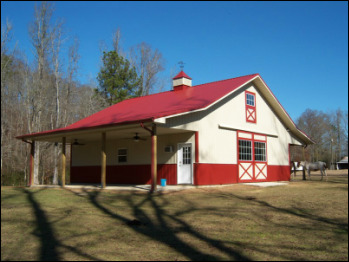 Pole barn designs pioneered in the 1930's led to the development of post-frame building design. Rounded utility poles were originally used to make the first "Pole Buildings" or "Pole Barns". Today's post-frame structures typically use square posts or laminated columns. Almost any low-rise building may be most quickly constructed using post-frame design. Although many people mistakenly identify them as “metal buildings” because metal cladding and metal roofing are common, almost any type siding, roofing or other architectural features may be used with post-frame. They can also be insulated to make them more energy efficient than other types of buildings. Although their range of use is growing, post-frame buildings remain the selection of choice for most agricultural buildings, including horse barns, riding arenas and other equine, livestock and storage applications. Post-frame technology is recognized as a truly significant advancement in the centuries-old art of wood frame construction. The development of this technology during recent years came about via the application of modern structural engineering principals and stress testing methods. An often-overlooked feature of wood is its insulation quality, which is far superior to that of steel or masonry. What's more, the natural "wall cavity" of a post frame building lends itself to the easy installation of a variety of insulation materials. You'll appreciate this fact if you elect to do some of the finish work yourself! Another significant cost-saving feature of post frame construction is the ease and speed of finishing both exterior and interior surfaces. Unlike steel or masonry construction, wood components used in post frame erection permit the direct application of a virtually unlimited selection of wall, ceiling and roof materials. The cost and time of installing "nailers" is eliminated. When the time comes to expand, your initial choice of post frame construction will again be amply rewarded. The same features which saved so much time and money during initial construction pay off again when you need to add on. Your addition will again be under roof and enclosed more quickly - and at far less cost than if you had originally selected some other construction method. --The above information courtesy of The National Frame Builders Association.